Cards-on-the-table time – your reviewer loathes with a passion (some might say with every fibre of his being, at times) a certain football club variously known as Scum, Glory Hunters Central, Manure and the Evil Empire. Oh, and they also go by the name of Manchester United, for the truly (and mercifully) unenlightened. I won’t go into detail as to the reasons for this particular life choice, suffice to say that I picked the team I hated long before falling for the team I love (it’s West Ham United, for those who care), but director Ken Loach and myself are going to have words the next time we meet. True, he seemed a very personable chap when our paths crossed on his last visit to Brussels (promoting his previous film, the sobering take on UK immigrant labour, It’s A Free World…(2007)), but, on the strength of his latest, Looking For Eric (2009), it would appear likely that our Ken is a United fan. Oh, dear. What is perhaps even more irritating is that fact that his light-hearted film is mostly very enjoyable (but with a dark streak running through it – this is Loach after all) and, perhaps worst of all, does a very good job of making ‘Red Devils’ fans appear likeable. Almost. Paul Laverty (who worked with Loach on his previous film) constructs a tale that appeals to heart and head alike – Steve Evets plays down-on-his-luck Manchester postman Eric Bishop, a life-long United fan who idolizes the one-time King of Old Trafford, Eric Cantona. He’s in the pits – burdened with two teenage stepsons from his previous marriage with whom he no longer has a relationship, and still doting on his lost love Lily (Stephanie Bishop) of 30 years ago, with whom he had a daughter, Sam (Lucy-Jo Hudson) then left in the lurch, Eric is looking out on a world without hope. Or so he thinks. A plaintive plea to a poster of his hero receives an answer, amazingly enough – a visit, in person no less, from ‘Ooh-Ahh’ himself. But Eric is not here to offer soft soap – he’s taking our man in hand, and there will be fireworks. Loach rarely makes a film with characters that are difficult to warm to, and this is no exception – while the basic premise is obviously rooted in fantasy, straightforward, gutsy performances from Evets, and particularly from Gerard Kearns and Stefan Gumbs as his stepsons Ryan and Jess, keep it grounded in working-class, football-loving realities, while the story’s darker side (Ryan’s growing allegiance to a gun-wielding local ‘psycho’ businessman, and the danger this poses to all concerned) is treated with respect and unflinching realism. A fairy story this ‘aint, but that’s not to say there isn’t room for magic. And Cantona himself? A marvel, as you might expect – he’s already won his spurs as an actor, and he’s clearly having a great deal of fun playing himself here: ‘I am not a man. I am Cantona.’ In addition, there’s a rare chance to see just how good he was – nothing short of magic on the field. There, I’ll unclench my teeth now. Say no more, I suppose, but you know what this means? Yes, that’s right, another squillion new ‘fans’ signing up at Old Trafford. Still, it might also mean that a few people who actually come from Manchester will start supporting the club. What do you think? Evets as Eric is pure 'working class hero'! Twined with Loach's aspect - from a Sociological perspective - of the 'game'that once meant the enjoyment of football - for all, this film highlights the gulf between the rich and the poor! loyalty, and a community held together despite the gulf. 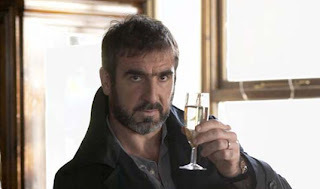 Bring into the 'king' that is Cantona, this film is a must for all Loach and Cantona fans, and proves - without a doubt -that Loach and Laverty still have the magic! Evets deserves best actor award for this gem. Many thanks for your comment - welcome to EFA Reviews! Yes, it is a very enjoyable collaboration - Loach, Evets and Cantona are a winning trio, and I agree with your thoughts on the sociological aspects. Sadly, Evets didn't win Best Actor at the 2009 European Film Awards, but there's no pleasing some people, right?